I don’t travel much, but when I do, I do a speed test. In my recent travel back from Las Vegas to San Francisco, I was rather surprised to hear that there’s on-board InFlight WiFi service on United Airlines that I was on. 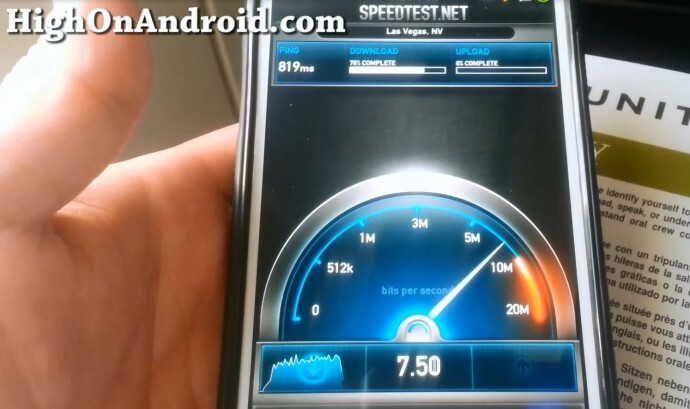 Last time I did a speed test 30,000 feet in the air was back in January 2010 when I was head to Vegas for CES 2010. Well, I was rather surprised to find out that InFlight WiFi has gotten like 50 times faster than couple years ago. Overall, I was getting near 4 to 9 Mbps download and around 1 to 2 Mbps upload speeds. Ping times were slow (as expected on a satellite link) but I was pretty impressed with the download speeds. Of course, it was short ride from Las Vegas to San Francisco (an hour and a half) but still, I did the same test 3 1/2 years back where I was only getting 0.15Mbps download speeds. Web browsing was pretty fast and I did not notice much difference between InFlight WiFi and my 4G LTE cellular signals other than slight latency due to the satellite link. I am pretty satisfied and just wish upload speeds were a bit faster so I can upload YouTube videos in the air. Do you have any experience using InFlight Wifi? Don’t forget to post in the comments with the Airline you were on, departure location and destination so it can help others deciding which airlines have the best InFlight WiFi. Next story What is an Android Custom ROM? Previous story AOKP MR1 Milestone 2 ROM Control Ribbons and Changes!